"Who reads much and walks much sees much and knows much." Julio is CEO of bioaccess.™; a US-based contract research organization (CRO) that delivers a full spectrum of market access, clinical research, and regulatory offerings from bench to commercialization so that foreign manufacturers of medical devices can have long-term success in Colombia —and the rest of Latin America. Julio's massive transformational purpose is to transform Colombia into the best country in Latin America for early-stage clinical research with innovative medical technologies. In this capacity, Julio has been actively promoting Colombia's clinical research capacity to the US and EU Medtech industry, and has worked with the national government to make his vision a reality (read more). Julio is a recognized medical device expert and is a contributing author at industry-leading publications such as Med Device Online and Clinical Leader. Julio's insights on the medical device industry have been featured on over 40 articles. 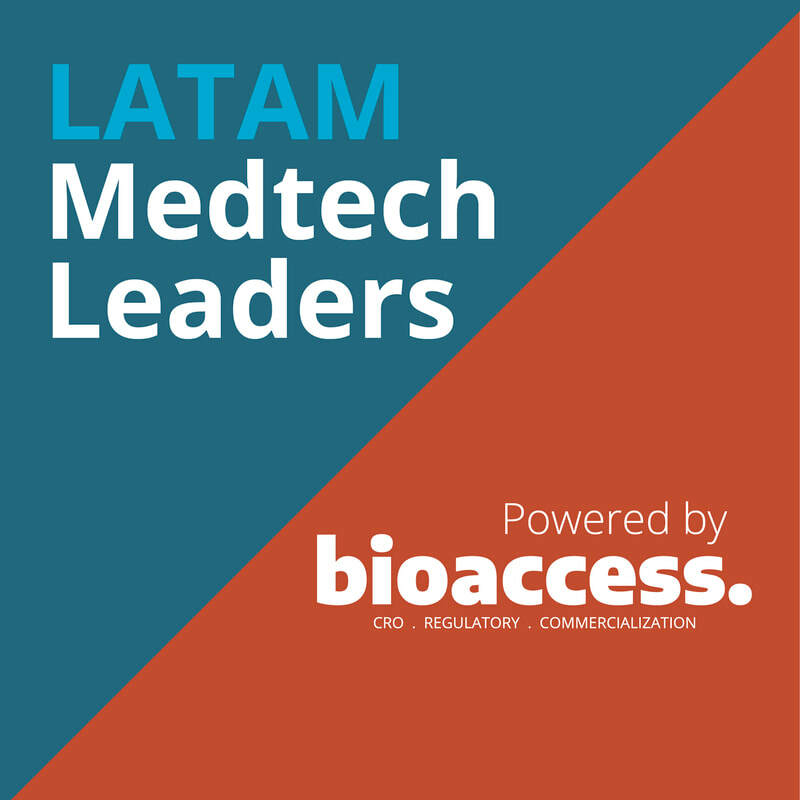 Julio also hosts the Med Device Online-supported podcast titled "LATAM Medtech Leaders: A weekly conversation with Medtech leaders who have succeeded in Latin America." Julio is the author of the book called "La Cebolla de Pandora;" a book about the evolutionary changes in human consciousness in light of the 2012 date that the ancients have proclaimed as a major turning point in the history of humanity. Julio's professional experience includes positions in engineering, consulting, and sales & marketing at Nortel and Alcatel-Lucent. In 2010, Julio joined Interventional Concepts, Inc. as its local representative in Colombia and in 2011 he became the company's CEO. Interventional Concepts was a US-based contract research organization (CRO) that offered a wide range of clinical trial services for Medtech companies looking to conduct first-in-man trials in Colombia. The company was founded by Dr. Pedro Martinez-Clark (Julio's brother); a Harvard-trained interventional cardiologist involved in the development of several innovative medical technologies. Read more. In 2017 Julio became a mentor at a government-funded program at the Macondo Lab Start-Up Accelerator in Barranquilla, Colombia —the top accelerator in Colombia, and one of the top 15 in Latin America. This Macondo Lab program is funded by Simon Bolivar University and Colombia's Ministry of Information Technologies & Communications. The program helps innovative technology startups become profitable and attract angel or venture capital investments. Julio's responsibilities include becoming a temporary member of the startups' board of directors and a mentor to the startups' founders. Julio helps these startups formulate and implement plans and strategies related to business development, lead generation, sales, digital marketing, communications, profitability, and financial leverage. In 2017, Julio was selected by INNpulsa Colombia —the country's entrepreneurship investment fund— as part of its group of experts available to be part of the advisory board of companies that INNpulsa funds. In this capacity, Julio is part of the advisory boar for EcoReap —a startup company that provides innovative and eco-friendly energy solutions in the Colombian Caribbean Coast. Between 2017 and 2018, Julio was the chief business officer (CBO) of Prointell Technology, S.A.; a Panama-based construction company involved in building affordable housing projects across the country. Julio was responsible for all matters related to seeking and arranging funding, operations, vendors, and managing the construction of a 20-house building project. Between 2001-2002, while at Alcatel-Lucent, he was the technical leader of the implementation of Telefonica’s IP network in Colombia and later established executive level relationships with end-customers, distributors, and regional and global partners such as IBM and Oracle. He had the unique opportunity to re-create Alcatel-Lucent Business Partner program in Latin America from a 1-page agreement to a world class channel program. This provided him with ample experience driving business projects and programs, measuring business performance and trends, and communicating cross-functionally. Between 2009-2010, Julio worked as a technology consultant for Johns Hopkins University Hospital assigned to the Trinidad and Tobago Health Sciences Initiative; a collaboration between the University of Trinidad and Tobago, Johns Hopkins Medicine International, the University of the West Indies, Trinidad and Tobago’s ministries of Health and of Science, Technology and Tertiary Education, and several other government ministries and local organizations aimed at improving the health care sector in the island-country. Between 2003 and 2007, Julio was the co-founder, President, M&M Investments in Orlando, FL. In this capacity, he acquired, renovated and sold over 60 properties over the course of 4 years; this experience provided him with invaluable real estate, investments, legal and financial skills. ​In 2003, Julio mentored startup companies as part of the U.S. Small Business Administration's SCORE program. Before that, he was a member of the executive committee at the Hispanic Business Initiative Fund of Greater Orlando. Here, he analyzed and opined on startup and existing company business plans in need of funding and advise. Founder and Director of Sales & Marketing for Latin America, EFI-X™/Art Studio Entertainment Media, 2008-2009. Mentor, Small Business Administration (SBA), Ft. Lauderdale, FL, 2003. Member of the Executive Committee, Hispanic Business Initiative Fund of Greater Orlando, Orlando, FL, 2003-2007. Product/Offer Manager for Latin America, Alcatel-Lucent, Miramar, FL, 2001-2002. Network Systems Engineer for Latin America, Alcatel-Lucent, Westford, MA, 2000-2001. Technical Support Engineer for Latin America, Nortel Networks, Billerica, MA, 1997-1999. Telecom & Networking Sales Account Executive, Microbit Comunicaciones, Bogota, Colombia, 1995 – 1996. Telecom Post-Sales Support Engineer, ComWare, Bogota, Colombia, 1994 – 1995. Julio ’s academic credentials include a bachelor of science in Electronics Engineering from Universidad Santo Tomás in Bogota, Colombia, and a Master of Business Administration (M.B.A.) from Western New England University in Springfield, MA.